What meals do you prepare for Breakfast, Lunch and Dinner? If you have any others in addition to the couple, can I share a tent with another person in the group? Why do Team Kilimanjaro use a different 7 day Machame schedule to every other company that runs climbs on Kilimanjaro? Our Advantage, Excel and Hemingway Series climbs include the use of portable loos. You don't need to use the public loos - unless you opt for a Lite or Superlite Series climb. Breakfast = approx. porridge, eggs, sausages, toast jam, beverages. Lunch = approx. light pasta-based meal with soup as a starter. Dinner = approx. more substantial pasta-based or rice-based meal, with soup as a starter and fresh fruit for pudding. The sauces are usually surprisingly tasty and varied and the meats we use are generally beef fillet, minced beef and chicken, bust some of my cooks have some idiosyncrasies in their repertories and I allow a little divergence from this if they request some changes. a) prior to attaining Barafu climbers will have visited the Lava Tower at 4,642m, where they will usually have had a slow and relaxed, hour-long lunch while sheltered in a mess tent, and brought their breathing rate very low. During this time, with relaxed breathing in a relatively oxygen-starved environment their chemo-receptors will detect a very low CO2 concentration and the necessary triggers for physiological adaptation to altitude, particularly increased haemoglobin production, will have been boosted. The climbers will then drop to 3,984m where the 50-60 millibars of extra pressure will provide sufficient reprieve for the body to undergo the changes that have been identified as being necessary earlier in the day. During this adaptive phase headaches are quite normal, but the following day climbers will be in better condition than they would have been had they rushed to Barranco and not bothered to stop for lunch en route at the highest possible elevation, or thereabouts. b) While prolonged exposure to altitude is undeniably deleterious, it has been known for a while that bodies can thrive considerably higher than Kilimanjaro’s summit. During the 1924 expedition particularly, and the early years on Everest generally, Norton and Odell experimented comprehensively with phases of having no supplemental oxygen. If memory serves, Odell found he could comfortably spend some 2-3 days at, and even above, the North Col (7,040m) without oxygen, without substantial detriment to his health and reserves. 2.7km west of this location and 5 kilometres from Everest’s summit I myself spent 3 nights at 6,010 metres with a girl of 6 years of age and she was completely fine. And I took my 5 year old to Kilimanjaro's summit in 3 and half days from Londorossi Gate (with vehicle support to 3,000 metres) two weeks after he summitted Mount Meru. Also, the monks live year-round at Rongbuk Monastery at around 4,800m, and they seemed quite fine to me when I visited them. So there is clearly nothing wrong, per se, in being at this height, provided it has been attained at a reasonable pace. Obviously if you read the totally out of date and unsubstantiated postulations of the Royal Geographical Society (who you will remember denied the existence of snow on Kilimanjaro for about 50 years because it was supposedly scientifically impossible) then you will be frightened to reach Kilimanjaro’s summit in fewer than 10 days. But each year we have the privilege of assisting hundreds of climbers safely to Kili’s summit on the 6 day Machame schedule. 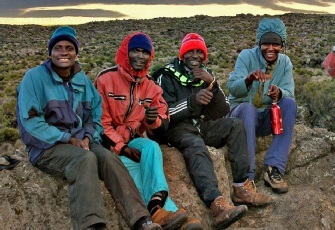 The majority of climbers attempting Kilimanjaro on the 6 day Machame schedule, with any company, will summit at around 0600 on day 5, which is actually only 3 days (ie 3 x 24 hour periods) and 20 hours after beginning their ascent from 1,860m, and most only suffer the mild symptoms of AMS that are almost always associated with the adaptive phase. All this said, in the context of a Kilimanjaro climb, it is indeed advantageous to minimise unnecessary exposure to high altitude prior to summitting, but certainly not at the expense of being in a better position to assault. Those who fail on the Machame Route will far more likely fail because of fatigue, sleep deprivation / inadequate rest and depleted reserves during the assault, than because of failing to acclimatise adequately. Starting from Karanga within the same 24 hour period as that in which a climber summits means that they will have to move 640 vertical metres to Barafu, rest there for just a few hours, probably getting no more than 2-3 hours’ sleep, before being woken late the same evening as the day in which they started from Karanga, to continue a further 1,215 vertical metres to the summit. In my experience, climbing 1,855 metres within 24 hours with no more than 3 hours’ sleep within this period (which is what is required on the conventional 7 day Machame Route that TK do not usually use), makes summitting much harder than if a climber is instead afforded a full nights’ sleep, a day’s rest, the opportunity to replace depleted reserves, carbo-load and re-hydrate, and then only have to climb 1,215 metres to the summit within a 36 hour period. That said, if climbers are quite senior and the guide judges that the 9.4km (5.8 miles) leg from Barranco and Barafu will over-exert them, we will always revert to the conventional 7 day Machame Route. Want to know what happens before you climb? Curious about a TK porter's lot? What happens before the climb? Will I be safe on Kilimanjaro?